The stamp, which is now available for pre-order, will be available for delivery following a first-day-of-issue ceremony, which will be held on Bush’s birthday, June 12, at the George H.W. Bush Presidential Library and Museum. “Great honor to be with Bush family and our advisory council members @Bush41Library for the unveiling today of the new @USPS postage stamp that will be released this June in honor of the 41st President’s 95th birthday,” Bush family spokesman Jim McGrath tweeted on Saturday. 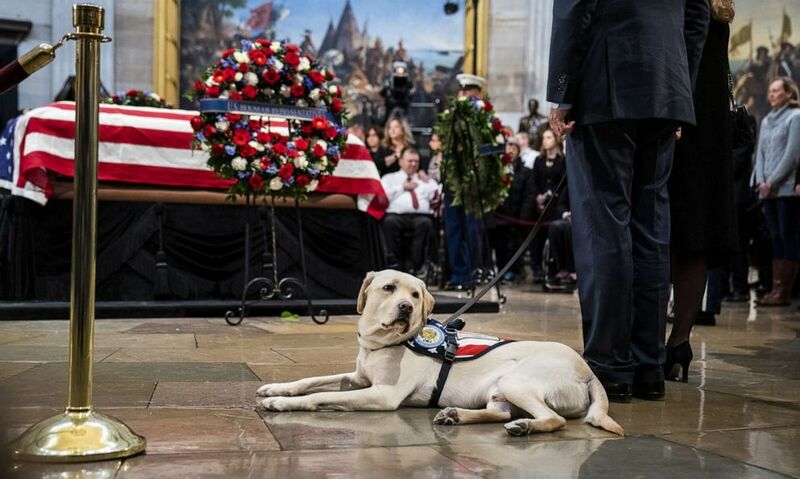 (Drew Angerer/Drew Angerer/Getty Images, FILE) Sully, a yellow Labrador service dog for former President George H. W. Bush, sits near the casket of the late President at the U.S. Capitol, Dec. 4, 2018. The stamp was designed by Phil Jordan and is the latest addition to its “Forever” collection, according to a USPS announcement. It is a portrait of Bush painted by artist Michael J. Deas based on a 1997 photograph taken by Timothy Greenfield-Sanders. “The 41st president guided the United States through the end of the Cold War and drove the creation of a multinational coalition that successfully forced Iraq to withdraw from Kuwait in the Persian Gulf War. An advocate for public service, Bush explained his vision of a nation of volunteers as ‘a brilliant diversity spread like stars, like a thousand points of light in a broad and peaceful sky,'” the announcement says. Next The police officer was shot on Sunday morning, according to a report.